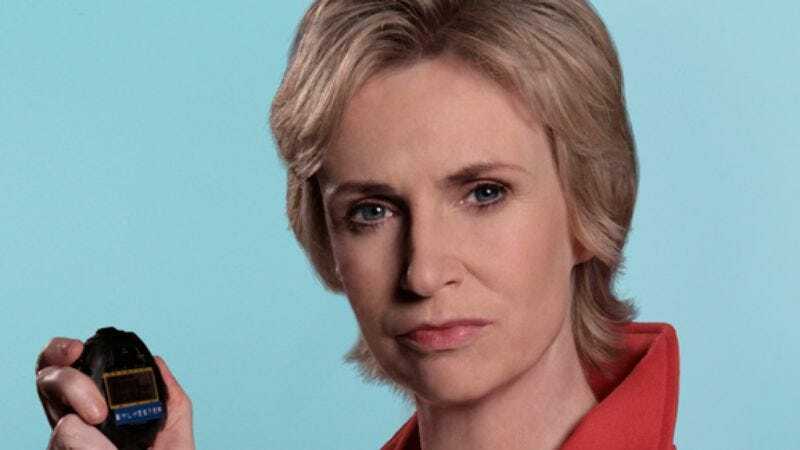 The actor: Jane Lynch, an actress who toiled in relative obscurity until she appeared in Christopher Guest’s mockumentary Best In Show in 2000 and subsequently became a go-to comedian for nearly every comic troupe working in Hollywood today: the Judd Apatow crew, the State folks, the Will Ferrell/Adam McKay group, the Arrested Development circle, and so on. Lynch just wrapped the first season of the Starz original series Party Down, and can be seen this summer in the big-screen comedy Julie & Julia. She’ll also be a regular this fall on the new Fox series Glee, which will be taking an early outing on Tuesday, May 19 at 9 p.m. EST, after American Idol. Jane Lynch: It’s like being back in high school, with that enthusiasm kids have for putting on a show. We have some extremely talented people that we’ve ripped off the Broadway stage. It’s awe-inspiring how talented they are, and how can-do they are. They’re at that stage of life where it’s like, “Yeah, let’s put on a show!” That’s really fun to watch. The A.V. Club: How much personal experience did you have in high school and college with musical theater? JL: I did choir in high school, and I loved it. I was in musicals; I did Godspell in high school, and Guys And Dolls. I did summer musical theater at Western Illinois University when I was in college. I did Gypsy twice. Those weren’t roles that were leads, but I had some speaking parts, I was a stripper in Gypsy. Mostly I was in the chorus. AVC: Glee is airing once and then going away until the fall. Have you begun filming the rest of the first season? JL: Yeah, we’re doing 12 on top of the pilot. We’re shooting our seventh right now, so we’ll be done in July, but the 12 episodes won’t be on until the fall. AVC: That’s an unusual way to promote a show, to air the pilot so far in advance. JL: I think so. I don’t know that it’s ever been done before. JL: That one’s all about food, which I love. Food and passion… you know, just your basic wonderful romantic comedy à la Nora Ephron. The relationship between Paul Child and Julia Child was just such a loving one that you could really feel through the pages of her book My Life In France. And Meryl Streep and Stanley Tucci are such a strong acting couple. They were wonderful in Devil Wears Prada, and here they’re bringing Paul Child and Julia Child to life. I play Julia’s sister Dorothy, so my scenes are with the two of them, and it was just a delight. We ate real French food—there’s a French chef on set—and even the catering and the craft service was all about good cuisine. AVC: Had you read the book it was based on? JL: Well, I read My Life In France. It’s delicious. She’s a wonderful writer. You really get a sense of the loving relationship between the two of them, and how Paul was so much her champion. It was kind of rare in those days—we’re talking about the late ‘40s, early ‘50s—that women were encouraged to create their own world professionally, and he believed in her so much and really supported her, while he was having his own career. She was a real go-getter herself. Almost naïve and innocent in a way, but she just kind of barreled forward, with her charm and her curiosity. She had such a curious nature, and really created a wonderful business for herself. AVC: Generally speaking, do you do a lot of research beyond what’s in the script, or was it just coincidence that you happened to read My Life In France? JL: I read it because I knew I was doing this movie. So that was “research” for the role. But it was a really wonderful book, so it didn’t feel like, “Oh my God, I have to read this book.” You’re really taken away by it. I recommend anybody pick it up, it’s a really lovely book. Now, the movie is based on this book, Julie & Julia, by… I forget her name. JL: Yes! The structure of the movie is from her book, but Nora took the Julia Child parts straight from My Life In France. JL: That was just good dirty fun. Good clean Christian fun. [Laughs.] That was a riot. We goofed around a lot. It was guys from The State: Ken Marino, David Wain. And Paul Rudd. They wrote the thing, and they were all there every day kind of throwing in new ideas. That is, until the writers' strike, when they stopped giving us notes. They weren’t allowed to do it anymore, as writers. But we had a really good time. It was a joyful shoot. Everyone was given a chance to go off the page and have fun. Those kids… Bobb’e Thompson was amazing, and Chris Mintz-Plasse is a wonderful actor and such a goofy presence. We had a really good time. AVC: So you shot during the writers' strike… Was that strange, not having notes or rewrites or anything? JL: No, most of the time when you shoot a movie, it’s all set anyway. For the first couple weeks, they were always scribbling away, and then that had to stop. AVC: Are you a WGA member? AVC: Do you know if improvisation is covered under the writers’ contract? JL: No, not at all. We get nothing for it. AVC: If there was somebody who was working on that film who was in the WGA, and they improvised, would that have been an issue? JL: No, we continued to improvise; that wasn’t an issue. We could still fool around. We were allowed to do it ’cause we’re all in the Screen Actors Guild. Improv isn’t covered under anything. We don’t get any credit for it, so it’s not under any union rule. JL: That was a blessed event. A wonderful ensemble, and we really got along very well… a happy accident of casting. I couldn’t wait to go to work every day. I started smoking, and had a hard time quitting when it was over, but I loved hanging out with these guys. I felt that we brought out the best in each other, and our writer John Enbom was just a revelation. He really nailed each and every one of our characters. We fooled around with his words a little bit. Martin Starr can’t say anything as written; he was always making it his own. But John was so good at speaking for us that for the most part, we stuck to the script. I think it sounds really off-the-cuff and really natural… lots of throwaways. AVC: Do you have any sense about whether Starz is going to bring it back? AVC: Will that be an issue if you’re doing Glee? JL: Yeah, I don’t know. I’d have to see. AVC: Looking forward in your career, if Glee takes off and you’re doing it for more than one season, would that detract from doing all these little roles in movies that you’ve been doing, or would you still find a way to fit that in? JL: You know what, I don’t know. There’s a set time when you do a series, so certainly I would be less available. We’ll have to see. I try not to think about that stuff, try not to plan ahead. I just kind of try to think in the moment. I always believe everything will work out the way it’s supposed to. And I love the idea of doing Glee as my day job. It’s so much fun, and they write so well for me. We have so much fun together, the writers and the kids and myself. It’s a really fun coming-together every day. JL: I did two episodes. It’s funny, because it’s a cultural phenomenon, and people who love it, love it, and know every breath of it. The two episodes I did have almost been a bigger event in my life afterward than they were for me at the time, when I was shooting it. It was only about five days of shooting, total. But a powerful show, and people really love it. So people remember me from that, which I love. It’s a little like being on Star Trek. You do a two-episode arc, and you get to go to conventions for the rest of your life. AVC: Are there any AD cons, as far as you know? JL: [Laughs.] No. Not yet. JL: That was a big deal for me. I did a commercial with Christopher Guest; that’s where I met him. And shortly after that—maybe a few months—he asked me to do Best In Show. So that was a real big deal, to get swept up into that movement, if you will. It opened up a bunch of doors for me. I felt like I fell into a way of working that really suits me. That was another one of those happy accidents that I could’ve never planned for, and it changed my life, really. AVC: Did you have to do much preparation in order to get used to that kind of improvisatory style? JL: Yeah. John Michael Higgins, I remember, always said you have to pack heavy in order to improvise. ‘Cause there’s absolutely no dialogue in the script. You know what the scene is about, but you have to show up as your character. You have to really know who you are… really let it sink in. You get to choose how you’re gonna look, what you’re gonna sound like. Chris gives you some backstory, and you get to take it from there. You have to really show up locked and loaded, and ready to handle anything. AVC: How often on a Christopher Guest film does a scene just have to be completely scrapped? Like you’re going in one direction and he says, “No no no, this is not what I wanted,” and you have to start over and go a whole new direction with it? AVC: Is it difficult to keep a straight face? People are surprising you with what they’re saying, and given that you don’t know what’s coming, is it hard to stay in character and not break up laughing? JL: Well, you hope you don’t do that. It’s frowned upon. [Laughs.] It’s like, you don’t want to ruin somebody’s take by giggling. I mean, it happens. It doesn’t happen a lot on those sets, but it happens. AVC: You’ve worked with pretty much all the major modern names in movie and TV comedy: the Arrested Development group, the Will Ferrell group, Apatow, Guest. What’s the difference between them all? Do you do anything different? JL: No, not at all. I think I’m there because they all kind of work the same way. It’s kind of loosey-goosey, and lets the person bring what they’re gonna bring. Sometimes it’s a little more scripted than not. But like in Talladega Nights, they went off the page almost immediately. So it’s pretty much the same thing. Just kind of a particular way of working. AVC: Is there much collegiality between those different groups? JL: Oh yeah. These are all really nice people, from my vantage point. People ask, “How do you get along with all those egos?” But you can’t really have that kind of huge-ego thing when you’re doing an ensemble comedy, because it just doesn’t work. Everybody’s very giving, very allowing and supportive of each other. It’s teamwork, you know. It’s not about somebody shining over somebody else. You kind of have to look at it that way, and act that way, or else it won’t work. JL: [Old-person voice.] “I remember back in whatever year that was… I was living in Chicago, where they shot it. I did a voiceover, that’s all I did. I showed up on set and I got off-camera with a microphone and headphones and I talked to Dolly Parton. So I got to meet her, but it was over in an hour and I was gone. JL: I probably auditioned for it in Chicago. Every once in a while, a movie would come through Chicago, and we’d all jump at the chance to do a Hollywood movie. And I nailed one of those jobs. AVC: Once you’re in a big movie like that, are you able to shop yourself around a little better? JL: I don’t know that in practicality, that’s true. I think that energetically, if I can get all crunchy-granola here, it gives you that confidence that you can do something. So I think that changes the way you feel, which changes your interactions. People want to be around people who have that kind of… calm. The anxiety in me lessened, and I think that’s when people want to work with you more, and the best of you comes out. ‘Cause there’s nothing worse than an anxiety-filled, fearful actor who just needs that next job, because they’re not gonna get that next job. Any time I got a job that made me feel good about myself, or made me feel, “Hey, I’m working my way up,” then good adds to good. Because it makes you feel better about yourself, and that makes you more attractive, I think. How’s that for California reasoning? JL: I recall that they didn’t finish paying me. They left town without paying anybody, and I had to go after them. I recall that they shot it in about four different languages, because they were gonna dub everybody. It was an Italian filmmaker, and I recall that the dialogue was written by a Russian guy. And my English dialogue was, “My comrades and I have been abused by the excesses of men,” or something like that. [Laughs.] And I was a taxi driver in Chicago. So that’s what I recall about that. JL: Absolutely. “It’s my big break!” That’s what I was thinking. Taxi Killer, I thought, would be my big break. [Laughs.] And The Fugitive, I thought would be my big break too. And actually, The Fugitive was… The difference between The Fugitive and Taxi Killer is like the difference between completely different worlds, but I did hope The Fugitive would lead to something else right away, which it didn’t. But it was really exciting, The Fugitive. Here I was, this kid from the south Chicago suburbs, and I was doing a scene one-on-one with Harrison Ford. My family was beside themselves. AVC: How long can you continue to dine out on talking to famous people? Can you still impress your parents, or your friends? JL: Oh I can still impress my family, yeah. In fact, I always text my family when I meet someone famous. I ran into Anna Faris yesterday and I texted my niece, and I said “Just hugged it out with Anna Faris,” and she was like, “Oh my God! OMG! OMG!” She got a big kick out of it. AVC: Do you feel famous yourself? JL: Do I feel famous? I feel more famous than I did 10 years ago, absolutely. AVC: Do you find that you’re one of those people about whom people say, “I know you from somewhere,” but they don’t quite know where? AVC: More often than not, if someone comes up to you and says “I loved you in—,” how do they finish that sentence? JL: It’s all over the board. If it’s a kid, like a 20-year-old kid, it’s usually 40-Year-Old Virgin, Role Models, Talladega Nights. If it’s a young girl, it’s Cinderella Story or Sleepover. If it’s an adult with good comic taste, it’s Best In Show or the Christopher Guest movies. It’s really spread out. JL: MDs was an attempt to be an answer to ER on ABC. It was a medical drama that they tried to throw a little comedy into. I learned a lot about how they do things in television, because it was my first television series. The pilot was very dark and edgy, and had an element of comedy to it, kind of how Chicago Hope was, with little absurd things happening. One of the doctors was actually a drug addict who would take his own drugs, and get cooked on Vicodin or something. And by the time we got done shooting the pilot and it was picked up and we were on to the first episode, that was alllllll gone. [Laughs.] They added this goofy music, and it lost its edge. And we kind of all knew. I was calling and checking the ratings each week, but everybody knew that our days were limited. It was really in this crazy limbo, and there was no support for it. I felt really bad for the writer, because he was so good, the guy who wrote the pilot. They kind of took his baby and turned it into this ridiculous thing that didn’t live anywhere. And we had really good actors, and everybody was really trying to navigate it. We all tried gamely to make it into something, but it was doomed. AVC: Do you have any desire to get to a point in your career where you have some kind of personal control over a project? Where you could be the one to guide it the way you want it to go? JL: I do, and you know what I love about right now is that in the last few years, I’ve been really lucky to be on jobs where I know the director and I know they’re gonna edit it well. It’s all editing… especially comedy. You gotta have somebody who knows what they’re doing with the editing, and be confident that they’re not gonna waste what you feel are your brilliant moments. [Laughs.] Not let them blow right by. I’ve been lucky that our Role Models editor was really good, and Judd Apatow has a great guy, and Christopher Guest uses Robert Leighton, who’s a wonderful editor. And Chris is also there the whole time with him… Well, all directors are, but he’s right there putting it together. So it’s rare that I do something that doesn’t come out as good as it possibly could be. I did an independent film in Baltimore once that I thought was fabulous, but the editing really killed it. It still hasn’t found its footing, and no one’s buying it. I loved it, and it was a wonderful process doing it, but it’s the editing, y’know? You can win or lose in the editing. So I guess to answer your question, right now I don’t know anything about editing, except I know when it’s good, but if I had to, I would like to be a part of that, shaping something. AVC: What about getting back to drama at some point? JL: Well I did Criminal Minds off and on for a couple of years. I probably can’t do it anymore now that I’m in a series. Things change when you’re in a series. Hey, there’s lots of good things about being in Glee, but some things are sad, like the stuff you can’t do anymore. I did Criminal Minds and I loved it. But I must say that I find the comedy stuff so juicy. Especially because I look at the comedy stuff as if it is a drama. The comedians who I admire that are really good, they always take it to a deep psychological place. I think the only way we can really get you to laugh hard is if we take it to a deep psychological place. It has to resonate with you on a really deep level in order for you to really do that good guffaw. There’s kind of a surface-level ha-ha-ha, but that really deep laugh has to come from a deep place. JL: That was a good time; that was fun. I loved working with Cybill Shepherd. We had a good time together; we enjoyed being girlfriends. It was a real comfortable fit for us. I loved putting on a suit and tie. When I was a kid, I wanted to be a boy. I really had gender issues. [Laughs.] I really thought I was supposed to be a boy. I used to sneak into my dad’s room and put on a suit, drink a cocktail, and pretend to smoke a cigarette. [Laughs.] So it was like I got to live out that fantasy for real. I got to wear men’s suits, and I loved it. AVC: Do you have any take on the show as a whole? Some gay women apparently loved it for being just as trashy as any other nighttime drama, and some hated it for being so frivolous. JL: It was a mixed bag, all six years. Every season was almost a completely different show. But what was consistent was the acting. The acting was always solid and good, and the characters were really well-drawn and well-conceived. And that’s Ilene Chaiken all over. She really created a magnificent template. The L Word was the first of its kind, because it was a regular television show—kind of in a soap-opera mode, in a melodrama mode—that featured lesbians as people like you and me, as opposed to this fringe subculture that was dark and dirty. It was a great mixed representation of American life, but with lesbians. Every once in a while, they’d have a coming-out story. I think they only had one coming-out story—Jenny’s—in the beginning. But basically it was about the trials and tribs of living in this modern world, and not so much associated with lesbianism exclusively. Except for I loved that they did the “Don’t ask, don’t tell” conflict with one character, and we had a character who died of breast cancer, which is something that affects a lot of women. So it wasn’t like we were denying the fact that women and lesbians have their own particular challenges, but basically it was, you know, a human story. The first of its kind. And it assumed a lot, when it debuted on television. It assumed that there was no bias or hate for this particular subset of life, that these were happy, healthy, loving people who face the same struggles as all people. So I applaud Ilene for that. The L Word ran for six seasons, and its appeal went across the board. I’d be stopped by straight couples and gay couples, saying “Oh, I love this show, and it means so much to me that this show is on.” Across the board. So I think it really was a phenomenon, and it affected a lot of people. I hope it’s not another 20 years before… Remember All In The Family, how groundbreaking that was? And then we went back to kind of silly television after that? I hope that doesn’t happen again.